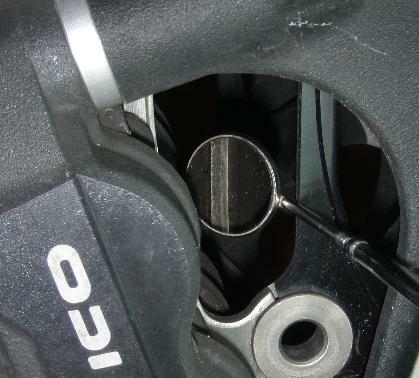 This DIY article describes how to inspect brake pads wear on a 2008 CBR1000RR Honda Fireblade motorcycle and is to the best of my knowledge also applicable for 2009 and 2010 models. Brake pads wear must according to the mainteneance schedule be performed every 6000 km (4000 miles), but it is a good idea to do it every 3000 km to be sure not to wear the pads too much down with consequent damage to the brake discs. This is an easy DIY task. A first timer may spend 15 to 20 minutes doing it, an experienced less than two minutes (not including the time needed to find the proper tools). 1) Using lamp and mirror inspect all four front pads. Turn the stearing fully left and inspect the right side pads. Then put the stearing fully right and inspect the left side pads. Look for the small wear limit groves on both outer and inner pads. They may be difficult to spot for the untrained eye. If you have pressurized air available use that to blow away dust from the area, but be carefull not to inhale the stuf. If the groves are present the pads are OK. If the groves are absent on any one of the pads it is time to replace all the front pads. 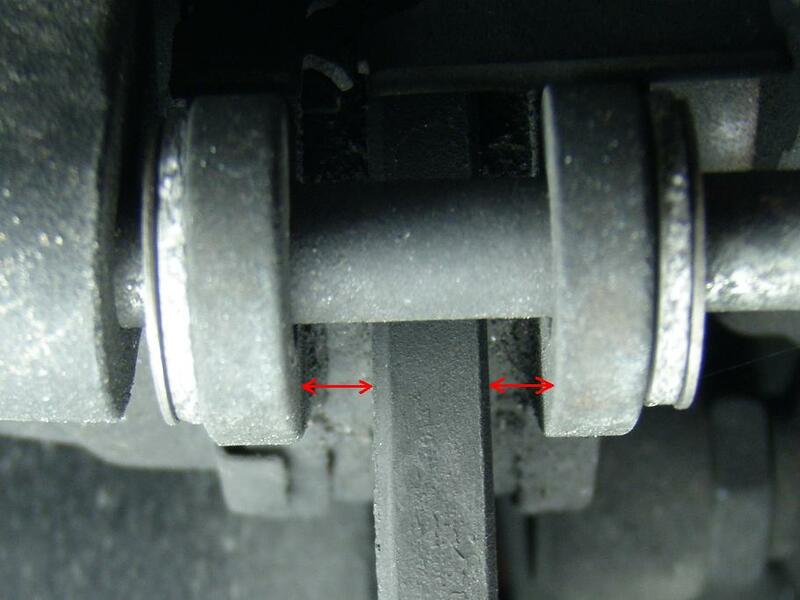 In the above picture the wear limit groves are visible, so the pads are OK.
2) Inspect the two rear pads. Look for the small wear limit groves on both outer and inner pads. Also here they may be difficult to spot for the untrained eye. If the groves are present the pads are OK. If the groves are absent on any one of the pads it is time to replace the rear pads. On the rear it is fairly easy to measure how thick the pads are. 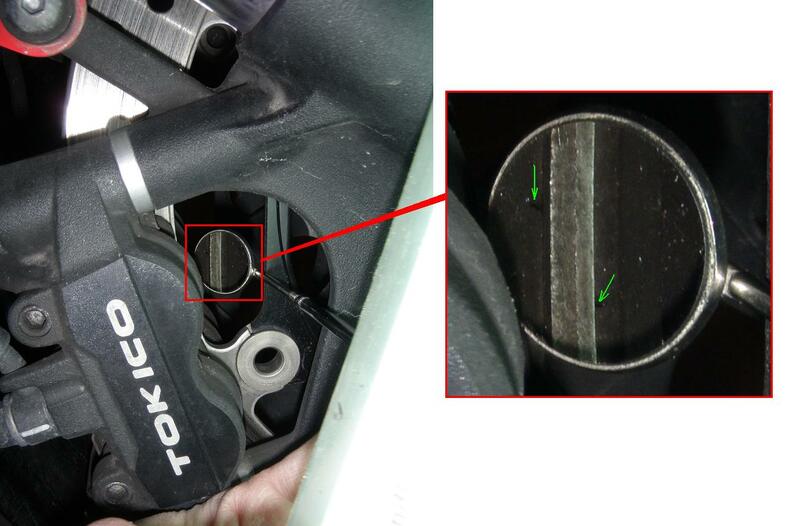 Simply measure the gap between the brake disc and the metal surface of the brake pad as shown on the enlarged image. In the above picture the groves are not visible and there is only about 2 mm material on the right pad, so it is time to replace the rear pads. 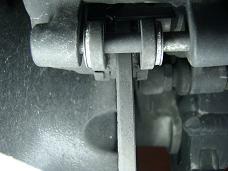 See the Brake Pads - Rear, Replacement DIY article about this.